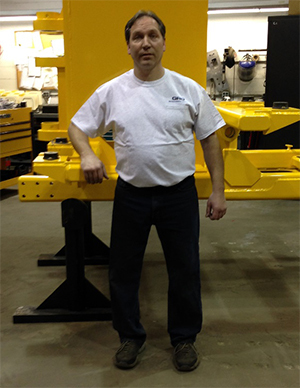 Gill Rock Drill is proud to announce Kevin Bender as their 2014 Employee of the Year. Kevin began his full time position as Supervisor of Beetle Production in 1993 and one year later was named the Employee of the Year in 1994. Kevin demonstrated his ability to trouble shoot the hydraulic and electrical systems, he also showed superior knowledge in the engine power for the Gill Beetle Drill. He was able to troubleshoot and diagnose high pressure air compressors which are essential to the down-the-hole drilling operation in both mining and construction. During the twenty years that Kevin has been at Gill Rock Drill, he has been instrumental in designing and implementing improvements in the hydraulic systems and engines for the Gill Beetle Drill. The Gill Beetle Drill began with a pre tier 1 diesel engine and has since used tier 1, tier 2, and now currently a tier 3 engine. Kevin has been at GRD through this evolution and has enabled the Gill Beetle Drill to meet the new EPA standards. When MSHA established that engineering controls be used to avoid overexposure to noise and dust in the drilling operations, Kevin contributed significantly in designing and building a new cab to meet these needs. Later on, his knowledge and expertise proved helpful in developing the second generation cab which was suited for improved comfort and visibility. Due to his in depth understanding of the system and his conscientious attitude, Kevin is able to advise customers and help them avoid additional expenses when maintaining equipment. This past year, Kevin has gone above and beyond, staying well past normal working hours to allow GRD to deliver Beetles on schedule. He has ensured very few delays in operation and is committed to ensuring GRD’s reliability and success.